You picked the Union Jack as the best designed flag of any nation-state. It also cracked my top 10 list. But I think we could both agree that when flags of other countries have the Union Jack in their upper hoist (e.g. Australia, New Zealand, Fiji) that’s pretty lame, right? BRANDON: Absolutely lame. I mean, other commonwealth nations and former colonies have their OWN flags. Canada has their own flag. Uganda has their own flag. Even the Isle of Man has their own flag without a Union Jack and they aren’t even a country AND much more part of the UK. It just absolutely baffles me that Australia and New Zealand, specifically, don’t have their own, considering their strong sporting legacy in non-British colours. To me this just feels like a 35 year old who still lets his mum pick out his clothes. Am I wrong here? DAVID: Right on. And to further the analogy, Australia and New Zealand are like twins that never developed their own independent personalities, as they both have nearly identical flags, but for the colour of the stars in their Southern Cross. But you bring up an interesting point about sporting colours, as there are a number of countries that compete in colours not found on their flag. Italy is always in blue and the Netherlands in Orange, for both the Olympics and the World Cup. In the former case, it’s strange that they pick a colour not on their flag. But in the latter case it’s the FLAG that’s missing a colour. I mean, isn’t the colour orange one of the first three things anyone associates with the Netherlands, along with tulips and windmills? BRANDON: Great point, David. Between the Italians and the Dutch, The Netherlands has the most potential for a great flag. Just think if their flag was simply the symbol they sport on their soccer kit in black centered on orange. This has top 10 potential and that’s why their red, white, and blue tricolor disappoints me more than any other flag. On the other hand I expect nothing less from the Italians, and in a sense, if there was only one country that we could grant an exception to in our rankings, I think they would make a strong case as an exception. Red and green is an easy, too easy, stereotype found too often in Italian restaurants and figures like Mario and Luigi. It’s not flattering. Fun fact: Japan is also another country that doesn’t match. They wore blue once and won. They didn’t win when they switched to red and white, so they decided to go back to blue. But in fairness these flags aren’t necessarily ugly, they just don’t seem to completely represent their nations (and I suppose that’s an easy statement to make as an American. Stars and Stripes FOREVER.) But I’m curious to find out which flags you find that are just plain ugly? You’re the designer so I’ll leave the question of which flags are plain ‘ugly’ to you. I would say that there are some flags that, whilst not necessarily aesthetically deficient, are just off-putting. 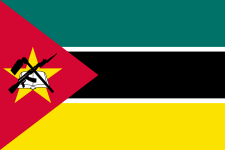 The most obvious example would be the flag of Mozambique. Putting an AK-47 on your flag isn’t really a good look for anyone, especially when the only association most of the world can make with your country is ‘civil war.’ I suppose maybe they get points for accurate representation, but I think your flag should represent your country’s aspirations, not just its grim realities. So what say ye? Are there any flags that rub you the wrong way as a designer? BRANDON: It’s funny you mention civil war as a cause for some odd flag choices, because one of my least favorite flags comes another country in a civil war, the Central African Republic. The flag just has a weird pattern, too many colors, and a weirdly placed star. At the same time its hard for me to rip into their flag because its like picking on someone who just doesn’t need to be picked on right now. The French already pick on them enough. Seriously, I just learned today of what amounts to a French Colonial tax that’s still imposed on France’s former African colonies. It’s no wonder the flag isn’t great, the French probably imposed it on them as a penalty for independence. Before I get into other ugly flags, I noticed we both included a “weaponized” flag in our top 10s. I had Saudi Arabia and its very sharp sword at #2. And your #1 ranked flag included a trident (Barbados) albiet a broken one. And there are many many more that include them but in different ways. Are you implying that there is a classification system for “weaponized flags”? That some weapons are more “flag worthy” than others? 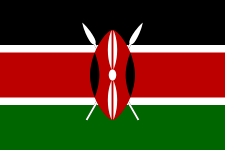 Based on this, how do you classify Kenya’s flag, is it capable of representing the aspirations of a nation? And also looking at the “weaponized flags” all but a couple are either from Africa or the Middle East. Is this concerning? DAVID: Yes, colonialism is alive and well, although I hadn’t realised until I read that article how old-school it is in the Françafrique. But yeah, weird flag for the CAR. Most flags, when you think about it, imply some sort of violence; many use the colour red to signify blood shed in this or that national struggle, and many, including the ones you mention above, feature some sort of traditional or indigenous weaponry to represent the country’s history and culture. But there’s something to be said for subtlety and representation. 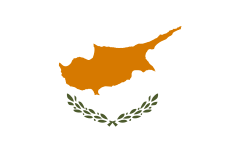 To take a slightly different angle, countries that just write their name on their flag (eg Paraguay) or have a completely literal map of their country (eg Cyprus) will never get my vote over a flag with a national symbol that is almost synonymous with the country itself (e.g. Canada) or a clever, well-thought-out but still simple depiction of the country’s geography (eg Brazil, obviously!). I guess for that same reason, I’m more sympathetic to Barbados’ broken trident, with all its’ powerful symbolism, or Oman’s khanjar daggers, with their reference to ancient customs and traditions, than to Mozambique’s very blunt and straightforward depiction of their brutal civil war in the 70s, 80s and 90s. In short, I prefer Van Gogh to Rembrandt. BRANDON: Catching you off guard? I’ll take that as a back-handed compliment, consider your answer satisfactory (when in fact its more than) and I’ll use your reference to Van Gogh and Rembrandt to segue. It is undisputed that Van Gogh and Rembrandt are legendary painters. You may prefer one to the other, but you can still appreciate the other’s works. This is not the case with Thomas Kincaid. He paints kitch, meaning his work lacks meaning and is overly commercial. He is despised by the art community while his paintings sell like hot cakes. I guess what I’m getting at are there any flags that you feel are overrated? And for the record, I’m punting. DAVID: Your punt is acceptable, as I believe you more or less said the Star-Spangled Banner was overrated in your first flag post, eh? 1. Red, white and blue. Someone actually did a statistical analysis on colour frequency and area cover on national flags and, no surprise, this is the most popular combination. Apparently the UN flag should have been done up in red, white and blue, as countries everywhere seem to love it! 2. Lions. Okay, there’s only a handful of countries that do this, but c’mon! If Tanzania or Kenya wanted to put a lion on their flag, that would make sense. But Fiji? A few lions would quickly devastate most of their islands. And sure, lions probably ONCE roamed Spain, but shouldn’t the monarchy be bothered that their representation on the country’s flag is an animal that the country hunted to extinction? Finally, a flag pun: What does the pink lion on Spain’s flag represent? Pride. Do you have any general flag pet peeves? Interesting you link to a clip from The Big Bang Theory in the same paragraph you used the word overrated, because it is the most overrated situational comedy on television at the moment #justsayin. However, I do give them some credit for working the word vexillology into primetime. The statistical analysis you provided would make my ugliest websites list, hands down. Props to Tanzania for having no red or lions in their flag, but having strong cases to include both. The Marshall Islands: The bands (another obvious equator reference), don’t go corner to corner making them off-putting. It also appears that they are supposed to imply a sense of depth perception that is not realized. Then the star… ouch. There’s no cohesive feel to the banner. 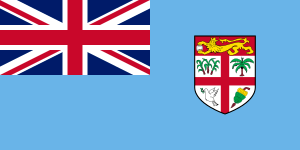 I should also mention that the flag was designed by the first first lady of the Marshall Islands. I suppose her husband didn’t have the heart to tell her he didn’t like it #cheapshot. 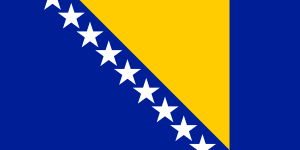 Bosnia & Herzegovina: Here’s another nation torn by competing ethnic groups with a history of civil strife. In fact this flag was imposed on the nation by the UN high representative at the time, a Spaniard. The flag has its issues, mainly: 1) obnoxiously large stars; 2) the use of a right triangle that’s not bound to the hoist. I just want to push it over. Seriously.. just nudge it over, or change the orientation of the triangle so it looks grounded and not divided. Have we covered it all the things wrong with world flags? Should we move to closing statements? Or better yet how does one wrap up a joint mailbag post? DAVID: Hmm, I’m not quite sure how to wrap this up. How about this: You’ve just opened a flag re-design consultancy — a startup with limited staff and resources. Which one flag redesign project would you take on? It may not necessarily be the one you like the least — just the one you’d be most keen to redesign. BRANDON: Ooh, I’d start by redesigning Bosnia and Herzegovina and the Netherlands. Follow that with Australia and New Zealand. Then onto the CAR and Marshall Islands. Shall we find a grant to apply for? Shall we kickstarter? I think we wrap up by sincerely thanking each other, plugging the other’s projects, and asking for reader suggestions. Thank you David, this has been fun and informative and you have my sincerest gratitude for your participation as you are a busy man now writing for the esteemed Salt Collective, among other places. I look forward to our next endeavor. And for those readers that have stuck with us this far, please do chime in with your snubs from this list or a passioned plea in the patriotic defense of your home nations banner’s inclusion in this list. DAVID: Well, as always Brandon, it’s been a pleasure blogging with you, especially on matters of such great import. Hopefully we’ll do another joint post before these Olympics are over! Also, I’m very much looking forward to the upcoming launch of your sports (and other competitions) reform blog! Finally, sorry to everyone we’ve offended! Hopefully you’ll still feel a sense of pride when you see your flag being hoisted to the rafters as your national anthem plays and one of your country’s finest athletes receives a gold medal. Unless of course you’re from the Marshall Islands, in which case, just, sorry.